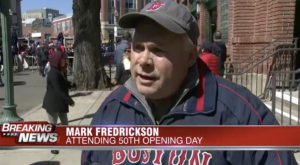 BOSTON (WHDH) – Mark Fredrickson lives in Southern Maine now, but he grew up in Topsfield in a family that loved the Red Sox. How much did they love the team? He’s been to 50 straight Opening Day games at Fenway Park. His mother got tickets in 1969 and Fredrickson says the tradition never waned, through bus trips and during his studies at Boston University, through canceled meetings and pushed-out deadlines. He’s never missed the first game at Fenway. Fredrickson got a gift from his kids Thursday — a Red Sox jersey, No. 50. It’s Mookie Betts’ number, but this gift is in honor of Mark’s attendance at 50 straight Fenway Park home openers. He told 7News his first great memory was Tony Conigliaro returning to Fenway — in his first opener in 1969. Conigliaro had been out since getting struck by a pitch in 1967. His favorite game? 2005, as the Red Sox got the rings after the 2004 title that broke the curse. He watched Yaz and Dewey and Roger and Pedro and Papi — all the greats who stepped on the field. And he even embraces the cold weather.